My name is Harvey. I'm 50 years old, yet a mere child in Christ. I was born of the Spirit on February 21, 1995. It has been difficult for me to share this testimony with others, due to the pain and shame it recalls of the life I lived. That life was filled with drugs, crime, violence and sexual perversion. I was raised in a small town. As a child, my homelife was picture perfect with an older brother and sister, loving parents who raised us with strong moral values in honor, respect and God. We attended church each Sunday and was involved in many of the church activities. Most of my fondest memories are of this time. I can not recall my parents ever arguing or even raising their voices to one another or us. Soon after my seventh birthday, I watched as my father packed his clothes and headed out the front door. I cried, "Where are you going Daddy?" He never turned around. He never answered me. He just kept walking. My brother and sister both crying, tell me that "Dad is leaving and is never coming back." My sister married later that year and left home. She was only 15. My brother began using drugs and ran away from home shortly thereafter. I did not understand, nor could I grasp what had happened to my family and to our home. I began to resent my mother and hatred grew within my heart. Now, left in an empty and broken home, I blamed her for the destruction of our family and I alienated myself from her. I could not and would not have anything to do with a "family' or "home". As I got older, I too began to use drugs and rebel against all authority. I soon hated everybody and everything. I started smoking pot early in High School and by the summer of my Junior year I was "fixing" brown Mexican heroin on a weekly basis. The next summer found me 3,000 miles from home, in jail on charges of possession and sales of marijuana. I was 18 and sentenced to state prison for a term 5 to 40 years. Because of my age, I received a conditioned sentencing of deportation from the state and one year suspended sentence. In an effort to get off the streets and evade the 5 to 40 year term, I joined the U.S. Marine Corps. To my surprise, drugs were now more readily available and in larger quantities here. I stopped using heroin and but began fixing and smoking cocaine. It was not long before I was arrested on base and through process, sent to a regional drug rehabilitation center. After months of evaluation, I was sent to a national center to serve eight more months in rehab. I was released and discharged from the Marines in 1978. Just one month later, I was arrested again, this time for armed robbery and headed to prison with no hope of release this time. I was convicted and sentenced to 5 years. It was here that I began to look for help. For some one to show me a way out of this life. Out of the drugs and crime. I started reading the bible but could not understand it. I knew there was a God, but where was He? Who was He? A man from the streets came in once a week for meetings. I began attending their weekly sessions. I soon learned how to meditate and chant, to calm my spirit. I was given books on Transcendental Meditation, Eastern Philosophy, EST and the occults. I read everything I could get my hands on about the spirit world. I soon found my spirit guide and this, I believed, was the way to heaven. I studied and immersed myself in new age religions. There was a change in my life, but not in what I did or how I thought, only it was now ok to be who I was. I could work my way to a better life, and if not in this one, the next life. I had plenty of time and a lot of fun to catch-up on. I left jail without much change of attitude. I was right back into drugs and soon meeting people with a lot of money and a lot more drugs. I began to sell and use large quantities of cocaine and crystal meth. With my connections to new age, I soon found myself in a cult that grew and distributed hallucinogenic mushrooms. I learned the art of cultivation of psilocybin mushrooms and taught by those "higher up", how to pray and chant daily within the growrooms to god, to the god that blessed us with these "children of light", in an effort that those who would eat them would see the "light". During this time, I met my wife and together we grew in new age religion, intravenous drug use, sexual deviation and immorality. The years past and our children were born. I began to know that our lives would soon have to change. This was not a life that I would condone or leave to my children. They were getting old enough to understand the things we were doing. They were so innocent and dependant upon us for what we were making of them. I knew this was wrong, even though my spirit said it was ok. I did not want my children to grow up to be like me! We moved from state to state and town to town in an effort to avoid the law from drug sales and production. We decided to stopped selling drugs and make an honest attempt to quit using, but to no avail. We slowed our use, but could not stop. As I was now in my mid-thirties, I learned to function in society and to hide my daily drug use. I held onto jobs for only a year or two, but quit time after time. I could not support a growing family and hovered in and out of poverty. Surviving on welfare and unemployment, I moved my family back to my hometown, where my mother lived. I met an old friend of mine and he asked if we would like to go to church with him. As an effort to conceal the life I led, I said "sure, we would love to". After all, I felt I was a "Christian". I knew who my God was. And I had changed my life for the better, a little bit anyway. Afterall, these people didn't understand all the things I knew to be right, how my new age beliefs were so far above what they could understand. But that was ok, everyone has their own plane of spiritual growth. It would be good for the kids too. True, I went to church when I was their age. This would be good for the family and my position in the community. We didn't go to church that Sunday and he continued to ask every time I saw him. I really wanted to go, and at the same time something in the back of my mind kept telling me that I was headed toward something much different. I can't explain this feeling, but I knew that something was happening to me, something was pulling on my heart. Several weeks later we were with some of our friends on a Saturday night smoking, drinking and doing drugs. Suddenly, something came over me and I stood up and said, "This is it !! I'm sick of this! I'm sick of this life! I'm sick of who I am! We're going to church in the morning." I proceeded to kick everyone out of my house. Yelling at the top of my lungs to never come back! That next morning, we dressed the kids and headed for church. There was something very different about me that morning. I spoke very little and to my surprise, my mind was clear. Clearer than it had been in a many years. I was headed . . . somewhere. I wasn't really sure where that was, but something was driving me. Something was pulling hard at my mind and heart. My wife and I sent the kids into their Sunday School classes and we sat down next to our friends. As everyone began to sing, I could feel the love that was in this place. A deep and honest love, something I hadn't felt in a long long time. The words I heard were sharp and cut deep into my heart. I began to cry. I knew how sick I was. My life was filled with sin and I couldn't stop. The tears never stopped. They just keep coming. As the service came to an end, I could no longer stand the sickness that controlled my life and my family. The pain of this life I lived was more than I could bear. Yet, in all the sorrow I could feel the love of someone standing very close to me. Someone who cared more for me than anyone ever had. He allowed me to feel the pain in my heart that He had carried for me for so long. My eyes were closed and my heart utterly torn into. I found myself kneeled at His cross. I felt a warmth begin to cover me. His blood began to flow down over my body. I shook and trembled as the words came from deep inside and crossed my lips . . . "Jesus, I am so so sorry, please forgive me". I dared not open my eyes. I could not look upon His face, for my shame was far too great. He looked down from where He hung, pierced hands and feet, then gently spoke my name. Softly He spoke to my heart, I heard Him say . . . "That's ok my son. I forgive you." I remember raising my hand as the pastor asked, "Is there anyone who would like to give their life to Jesus?" I opened my eyes. Everyone was clapping and seemed so happy. They were all looking at us. I turned to my wife. Her hand was raised and her face flushed with tears. She too, had given her life to Jesus. I had never seen her so beautiful before. Her face was aglow, with a love I only now began to understand. I had now, for the very first time, understood true love. The life I described above is but a shallow glimpse into the reality and sickness of my life. It spans more than twentyfive years of depravity. Yet, this testimony is not to the life I tried to destroy or the depths of sin which I obtained. It is a testimony to the Love of Jesus Christ and the Grace of our Father, who reached down from heaven and took my hand into His, pulling me out of the depths of darkness. 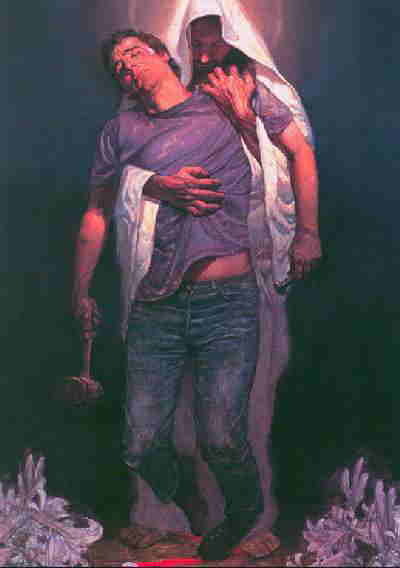 He rescued me from an eternal life of pain and anguish and delivered me out of a nightmare that would have never ended. My life is not my own, but His. He paid the ultimate price for my sin and wickedness and willingly took all of my sin and sickness upon Himself and submitted His life unto death. He did this to take the punishment that is rightfully mine. The "Lord of Lords and King of Kings", with power over all things, left His heavenly riches and glory to become a man, to humble Himself before His own creation. He washed the feet of those He created and died in our place. That we might live forever with Him in paradise. This is the truest of all love. "Who shall love him most? He, whom was forgiven most." I dedicate this to you my Lord - with all my Heart.